Roller Chains have many applications across a variety of industries and machinery – most commonly used as the power transmission element used to rotate conveyor belts for example. Statewide Bearings has a comprehensive portfolio of roller chain and conveyor chain products suitable for industrial, agricultural, marine and mining applications to name a few. 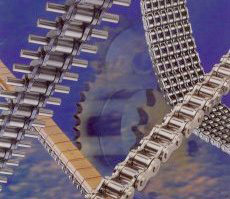 Stainless Steel Chains are suitable for corrosive conditions involving food, chemicals, pharmaceuticals etc. They are also suitable for both high and low temperature conditions. Nickel-Plated Chains are suitable for outdoor conditions – particularly when exposure to rain is a factor. Zinc-Plated Chains are suitable for environments that require anti-corrosive protection. Corrosive conditions are found in many areas – from the auto industry to food and beverage processing and packaging. Roller Chain brands we distribute include Tsubaki and KMC. Statewide Bearings also distributes a full arrange of gears, racks, standard pilot bore sprockets and taper lock sprockets to work with roller chains of any size and dimension. Check out our range of Sprockets here.